Sometimes even the most thoughtful designs and engineering feats are preordained to fail. Such is the case with IBM's Butterfly Keyboard (aka the TrackWrite), an ingenious solution to what turned out to be a temporary problem. The year is 1995. Terms like "ultraportable" and "small footprint" are becoming a fixed part of compu-jargon, and computer makers are doing their best to shrink down their laptops for the traveling business set (the only people really interested in these ultraportables at this point). The problem with these tiny lappies? Aspect ratios (4:3) and screen sizes (~10.5-inches) mandated some supremely uncomfortable compromises in keyboard size. 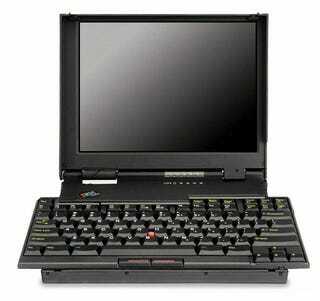 That is until IBM designer John Karidis came up with an elegant solution for the ThinkPad 701c. Karidis figured out a way to stuff a full-sized keyboard (11.5-inches) into a 9.7-inch laptop by dividing the keyboard into two interlocking pieces that folded in and out as you opened and closed the laptop's lid. Because the movement was driven by a cam on the lid's hinge, the keyboard's movement was always fluid and in step with the motion of the lid. In fact, this transforming keyboard was so artful and unique, it's now on display at MoMa. Unfortunately, while the butterfly helped make the 701 the top-selling laptop of 1995, neither the keyboard or the laptop series had much of a consumer self life after that. As screen sizes and aspect ratios grew, the need for such a keyboard quickly became redundant. Thankfully, obsolescence didn't occur before Paul Reiser could make an ad for the 701.